How often should I check an employee's driving licence? This is a question we are asked by a large majority of our clients and also non-clients too. For this type of question, there is no concrete answer, but we can guide you in the right direction by going back to the basics and looking at what it is we're trying to achieve by conducting a check on a driving licence. 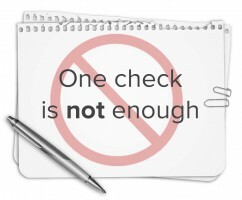 Back to basics - what is a licence check? It's widely understood that our driving licences carry information regarding our driving record, such as our current points, disqualifications and of cours which vehicles we are licensed and eligible to drive. A licence check performed by an organisation on an employee's licence will return all of this data, enabling a holistic view of driver risk. The results of the check may be an indicator as to whether additional training should be put in place for certain "high risk" drivers, or worse, may be the only way of knowing if a driver has had their licence revoked and shouldn't be driving for the company. Without periodic licence checks, businesses are left at risk of prosecution and fines if an employee driving on company business is involved in an accident. This part is important: A single licence check at the beginning of employment isn't enough. Relying on employees to disclose when they have received penalty points, convictions or disqualifications poses a huge risk - employees that are keen to let their employer know of changes to their driver records are few and far between. Many employees, intentionally or otherwise, will not update their employer about changes to a licence, particularly if acquiring points could put aspects of an employee's job at risk. The method of relying on an employee to provide you with vital licence information is not a viable process to support licence checking. Losing your driving licence may onlybe one offence away - driving whilst using a mobile phone, for example, could cost a driver six points - this may be the tipping point for many of your employees, leaving them disqualified from driving and potentially a massive risk to your business. If you are looking to eliminate risk and improve your licence checking process, our award-winning Driver Risk Score generates a risk profile for all of your drivers based on a complex algorithm, which amalgamates everything from points and severity of endorsements, to submitted health conditions that may affect driving. Driving Risk Score is included as a standard feature of our DAVIS Software. If you are interested in fulfilling compliance and minimising risk, request a free, no-obligation quote or take a look at our solutions.